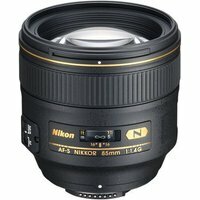 The Nikon 85mm f/1.4 G AF-S Lens is the successor to Nikon's popular AF Nikkor 85mm f/1.4D IF lens. Designed for use with Nikons FX-format DSLRs, this professional medium telephoto lens features a fast f/1.4 aperture, as well as a Silent Wave Motor (SWM), and Nikon's Nano Crystal Coat to reduce ghosting and flare. The 9-blade rounded aperture produces soft and pleasing blur characteristics.